Why should we look at original gravestones rather than relying exclusively on transcriptions? In most cases, there is an easy answer to that question — the transcription does not preserve the iconography present on the original. Other important aspects of the stone are also lost in transcription — type and quality of stone, size, position, proximity to other stones, etc. A photograph fills in some — but not all — of those holes. But even with this stone, which has very little embellishment, a transcription would miss some intriguing details. 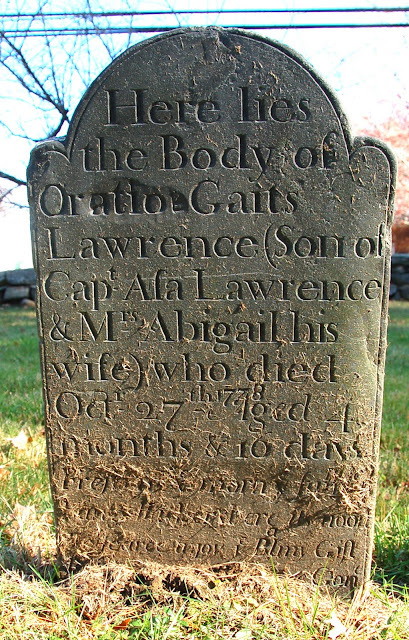 For example, the original omission of the year implies that this stone may have been carved in late 1778 or early 1779, when the carver (or epitaph writer) when the year in question was so obvious that it slipped the writer's mind. That may be overthinking things — perhaps it was just a matter of an eye skipping a line — but it seems much easier to forget to specify the year for a recent event than a distant one. Young Oratio's name also makes me wonder about the production of this stone. He was obviously named for General Horatio Gates, whose victory at the Battle of Saratoga in October of 1777 made him an American hero. Yet, the carver misspelled both names. Why? If he was working from a written order, the mistake may have originated with the family member or friend who composed the epitaph. If he was working from an oral order, he may have done his best to spell it phonetically. In either case, two things seem to be true: 1) the first try, beginning with "Or-" was not satisfactory and had to be gouged out, resulting in a second spelling that was still wrong, and 2) whoever came up with this spelling knew about Horatio Gates through oral sources, but may never have seen his name spelled correctly. Taken together, these clues indicate that people in Groton were talking about Horatio Gates, but they weren't all reading about him. Perhaps they heard his name when a newspaper was read aloud or when a minister prayed for military success. Someone should put a book together on phonetic spelling on stones/documents (unless it's out there somewhere?). The probate for Providence stonecarver Asa Fox includes his son "Oris" -- which turned out to be later Boston stonecarver "Horace" Fox. Then there's the regional accent issues (which you've partially documented with your instances of "depated this life"). I like "Washbon" instead of "Washburn," "Kezier" instead of "Kezia," etc. I came across "Patridge" in the paper today and having seen this on a number of stones always figured it was a "Partridge" with an accent; but I'm not sure all "Patridges" were in fact "Partridges." Then there's "Soule" which I first pronounced as if it were French, then realized it was probably pronounced "soul" with a silent "e"; but then came across a couple stones that spelled it "Sowle" -- but was that pronounced "sow" as in a female swine, or as in planting seed? Oratio's dad was recently the subject of J.L. Bell's blog. I am a descendant of Captain Asa so this stone and the JL Bell reference delights me!